Download Around the World in 80 days for free at FreeRide Games! The bet is on: British gentleman Phileas Fogg must make it Around the World in 80 Days! Jean, his French servant, is going with him, and Fix, a police inspector, plans to pursue the travelers, as he believes they robbed the Bank of England. 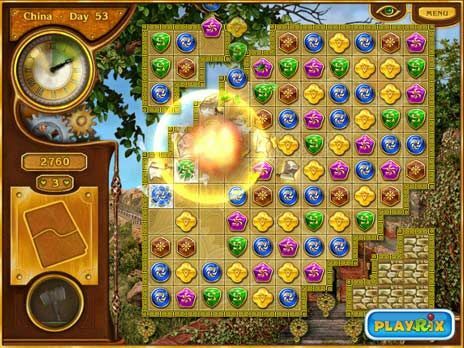 Help Fogg elude Fix's traps, save an Indian widow and find his way through a jungle in this breathtaking Match 3 puzzle adventure. To win, you'll have to be courageous, clever and observant.